The outdoor recreation complex is situated on the grounds of New Ross Consolidated School located on highway 12. 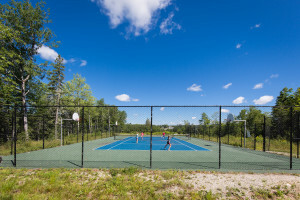 Work up a sweat on the combination basketball/tennis court, or the many apparatus’ that make up the fitness circuit. Sit back and relax at the picnic area while watching the young ones play on one of two outdoor playgrounds. Fun for all ages!